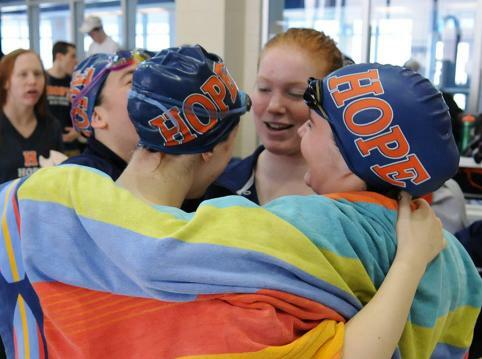 Junior Sarah Sheridan repeated as Michigan Intercollegiate Athletic Association Diver of the Year as the Hope College women’s swimming & diving team wrapped up the 2015 league championships in second place on Saturday at Holland Community Aquatic Center. Sheridan claimed one of the three individual MIAA titles the Flying Dutch earned en route to 748 points that trailed only Calvin’s 781. Sheridan repeated as champion in 1-meter diving on Saturday with a six-dive total of 474.10 points. She surpassed the school record of 469.10 she recorded during preliminaries. Junior Jorgie Watson of Grand Rapids, Michigan (Catholic Central HS), and freshman Chloe Palajac of Dearborn, Michigan (Dearborn HS), also won on Saturday. Watson defended her 200 breaststroke title as she swept the breaststroke events for the meet. She posted a finals time of 2:22.84. Junior Michelle Hance of Noblesville, Indiana (Noblesville HS), took seventh in the 200 breaststroke at 2:29.25, while senior Taryn Gras of Zeeland, Michigan (Zeeland East HS), was 11th at 2:35.43. Palajac won the 200 butterfly in 2:08.02. Sophomore Katie Smith of Mokena, Illinois (Lincoln Way East HS), came in ninth at 2:19.98, while freshman Natalie Vela of Clarkson, Michigan (Clarkston HS), was 10th at 2:19.35. Senior Erica Dunham of Rockford, Michigan (Rockford HS), finished MIAA runner-up in 1-meter diving by scoring 452.65 points. Junior Stephanie Polet of Grandville, Michigan (Grandville HS), was eighth at 414.0. Junior Lindsay Wiederhold of Plainwell, Michigan (Plainwell HS) claimed MIAA runner-up honors in the 1,650 freestyle with a time of 17:31.14. Junior Virginia Cotterall of Spring Lake, Michigan (Spring Lake HS), finished sixth in 18:24.67, while junior Kaleigh Mullen of Rochester, Michigan (Pontiac Notre Dame Prep), placed seventh at 18:43.81. Sophomore Molly Meyer of South Bend, Indiana (John Adams HS), claimed MIAA runner-up honors in the 200 backstroke by posting a time of 2:05.05. Junior Hannah Larson of Jackson, Michigan (Jackson HS), came in fifth at 2:10.74. Senior Lauren Girard of Rockford, Michigan (Rockford HS), was 13th at 2:19.86. Junior Klare Northuis of Holland, Michigan (Holland HS), placed sixth in the 100 freestyle at 53.28. Three teammates made the consolation race: senior Emily Weber of Milan, Michigan (Milan HS) in ninth at 54.35, freshman Amy Larsen of Grand Rapids, Michigan (Forest Hills Northern HS), in 10th at 54.61 and senior Luisa Burgess of Pittsburgh, Pennsylvania (Taylor Allderice HS), in 11th at 54.77. Hope took third in the 400 freestyle relay. Weber, Burgess, Meyer and Northuis went 3:33.66. Four runner-up performances Saturday helped the Hope College men’s swimming & diving team rally for a third-place team finish at the Michigan Intercollegiate Athletic Association Championships at Holland Community Aquatic Center.